Summer is over. The days are getting shorter and cooler. Tree leaves suddenly started to turn colors this past week. All signs of the impending arrival of grapes at the winery! Usually the first grape to arrive towards the end of September is the pinot noir that I purchase from a vineyard in Westport, MA to make our infamous Rosé of Pinot Noir. For a rosé, you actually want to pick the grapes underripe when sugar levels are lower and acid levels are high, so pinot noir grown in the short growing season and cooler temperatures of New England is a perfect match. After the pinot, grapes (petite sirah, syrah, & cabernet sauvignon) from the Suisun Valley in California start to trickle in around early-October. A couple of weeks later, my Washington grapes (merlot, cabernet franc, & viognier) show up since the Yakima Valley is a little cooler than the Suisun Valley in California. Somewhere in the middle of all that comes the Massachusetts chardonnay. Bringing up the rear towards the end of October is the merlot & cabernet franc that I get from Rhode Island and the late harvesting California varietals such as petite verdot or zinfandel. That’s the usual order of events…but not this year! Weather patterns have turned on their heads this year. Massachusetts has seen a remarkable cool and dry summer. I can count the number of times I turned on the central AC on one hand and have fingers left over. Great for keeping the electric bills lower, but not so great for grapes. This year, the New England grapes are ripening very slowly and anywhere from 2-3 weeks behind normal harvest dates—and the 38-40° night temperatures of the past couple of weeks are not helping things! The good news is that the lack of rain is reducing the risk for fungal outbreaks. The polar vortex which has brought cold air and gorgeous blue skies to us is also keeping the fall hurricane/tropical storms to our south, which means we can continue to let the grapes ripen on the vines. On the flip side, California has been hot this summer…and dry. 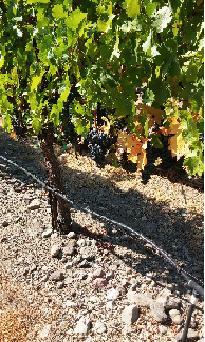 Heat and drought means one thing—very early grape ripening. 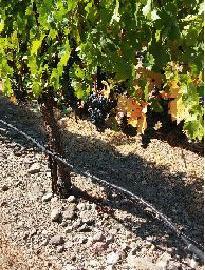 Some vineyards started to harvest pinot noir & chardonnay the first week of August! Unprecedented early harvests! 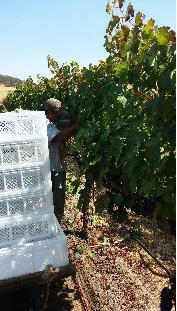 August cooled off a little, but harvest is still running 2-3 weeks ahead of schedule. Washington has also been dry, but it’s a little cooler being up north, so harvest is more like 1-2 weeks ahead of schedule. The bottom line…I got the call today that my CA petite sirah, syrah, & cabernet sauvignon will be arriving on Monday…before we bring in the MA pinot noir! WA grapes are not far behind and the MA grapes will arrive in the thick of things (also just received word that pinot picking has commenced). This fall is going to be a mad scramble and methinks I’m not going to sleep much during the month of October! I did have a unique opportunity to witness the CA grape harvest. Had a day job conference in San Francisco last week so my wife came along and once the conference was over on Friday, we headed north. Stopped to see some ginormous trees in the Muir Woods National Monument and then went checking on the vineyards. Made some contacts for potential new vineyards next year and stopped into our Suisun Valley vineyard partner where we got to witness the start of petite sirah harvest! I was tempted to grab a knife and dive in to help pick, but let’s face it, I’d just slow the experts down!